What is Gas Station Glam? GSG is a brand new design company that was born from the drawings of Ella Reid. Ella and her ever dynamic and colorful ways decided to put her drawing in a wearable form for her performances find her music at ellareidmusic.com and people are loving and can't get enough so here we are delivering the energy to you!. Gas Station Glam embodies a playful, exploratory Art form that is dancing across the universe! 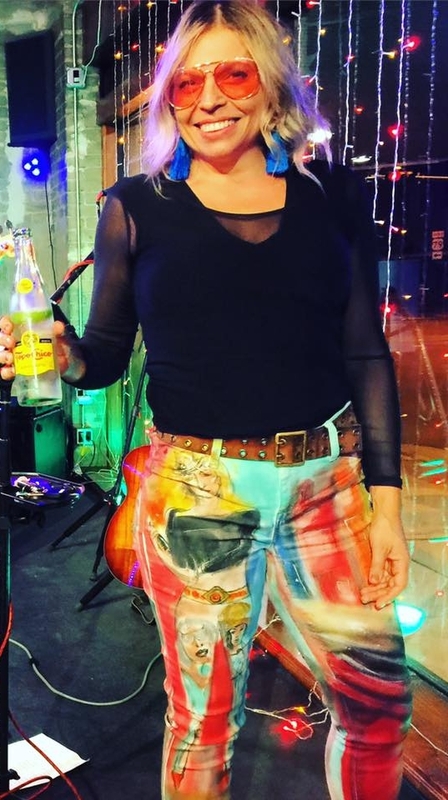 Creator Ella Reid is an Austin, TX based indie country, singer-songwriter who's dynamic personality and multi-talented nature has taken her into custom design and fashion! You can listen to her music at EllaReidMusic.com. 2 Years ago, she quit her design job and she and husband relocated to Austin. Here, she became a full-time musician and ignited her desire to create, draw and use her design in a wearable media! Gas Station Glam was created out of customizing her stage wardrobe and learning to dye and distress show wear. She drew her first pair of pants and it's been full steam ahead since then. She still performs full-time with her husband on bass and a full band and fashion is an easy step to more show stoppers and country music hits!